Earl Ball won the Men�s Division again. Earl is one of only 3 shufflers to wear the green jacket signifying over 1000 FL points. Betmar is Earl�s home club and he is an inveterate volunteer and perennial winner. Third place was claimed by Ron Nurnberger of Bradenton Shuffle Club where he is now President. A Pro for only 8 years, Ron was inducted, along with Pam into the FSA Hall of Fame in January. This was Ron�s 4th FSA Masters. This columnist appreciates each reader who cares enough about shuffleboard to enjoy these reports. Next week should be final for the season. Last week we covered the 2019 SWCD Masters. A devoted shuffler, Pam Nurnberger was present because Ron was playing, but she was not and when it became apparent to her that I would be pushing back for the District Amateur Ladies in addition to sweeping, beading, and making third calls, she volunteered to be the pusher. The need arose because the District Amateur Ladies playing only totaled six, so four on one court and two on another. I supposed she would be doing this once, but lo and behold, she pushed all week. She might have been the most qualified player ever to volunteer to push all week. She subsequently was inducted into the Southwest Coast District Hall of Fame at the end of the Masters on Saturday, March 23 and is now playing in the Florida Masters at Betmar. Also inducted in absentia was Joan Wheeler, who played for decades from golf Lakes, and who won most every level from club, through District, State, National and International. Joan wore a hat with about 20 medals on it. Also inducted was Dwayne Cross, playing out of Bradenton Shuffle Club, and who also plays in Ohio and Michigan and in National and International play. Always solid and always a gentleman. Mrs. Judy Cross is also a wonderful person and a competitor. Faren VanDeGrift of Bahia Vista Estates also was inducted. Frequent partner of Jim Miller and Clarence Gingrich, a quiet, sincere, unassuming gentleman, perhaps without an enemy in the world, he greatly deserves and humbly accepts this honor. Arlene McCague of Palmetto and Ohio also achieved 200 points this season. Her comment: �Thanks to all my partners who helped me along the way, you know who you are. I am still learning at every game.� Mr. McCague also attended the installation ceremony and shared the decorated cake. FL P-26, March 25-26 At Sebring, FL Tournament of Champions, All Singles. Pro Ladies Main: 1. Terri Smith. Pro Mens Walking Consolation: 2. Dave Kudro. Pro Mens Non-Walking Consolation: 4. John L. Brown. Amateur Ladies Main: 1. Elaine Antaya. The Amateur Tournament of Champions, still in the experimental stage was a huge success with 19 ladies and 38 men.
. Elaine Antaya merits special attention here. Playing as a State Am this season, she not only won first in the FL T.O.C., she earlier won second place at Mirror Lake in the Can-Am Tournament. Having just returned to Lindsay, Ontrario, she found 8� of new snow this past week. But, she and Patrick can go to the basement of their home 2 � hours northeast of Toronto and practice on their half-court shuffle surface.
. Among 16 players and 2 alternates playing this week at the FL Masters, FL P-27 at Zephyrhills Betmar are Pam Nurnberger, Terri Smith, Ron Nurnberger, Dave Kudro, and Tom Putnam with Flo Kowalewski Ladies Alternate. The Masters lasts from April 1-4, so fans could still attend today all day and/or tomorrow until noon. Trailer Estates hosted the 2019 Southwest Coast District Masters March 20-23 with 42 players in 6 Divisions. Perfect weather helped most have a very pleasant week. 1. Janet Eisses of Golf Lakes and Nova Scotia raised a family of 5 on a dairy farm with her husband Henry, and has enjoyed shuffle since 2015. 2. Mary Federation enjoys shuffle at Golf Lakes in Winter and returns to the Finger Lakes area of New York to be near children and grandkids. 3. Marcia Clark of Michigan is in Florida for the first time and enjoys meeting so many players who seem likely to be lifelong friends. She is elated that her husband and her parents all four placed in this tournament. 4. Ursula Joyal is from Sun City Center and has shuffled for a few years so far, having also placed last year. 1. Fernand Montplaisir is from Montreal, Quebec, winters in Trailer Estates and has shuffled here for less than five years. 2. John Simmons of Piney Point and London, Ontario spends 5 months in Florida, so far. He plans to join Bradenton Shuffle Club next year when returning �HOME� to Florida. 3. Donald Cadotte, French speaker like his friend Fernand, is also from Quebec and Trailer Estates. The two of them are tireless workers and players, as is Donald�s wife, Murielle. 4. Jeff Kuhn is quite new to our District and competed surprisingly well, spurring us to believe he could progress even more next season. 5. Karl Clark, husband of Marcia and son-in-law of Tom and Cheryl Putnam here at Trailer Estates, in his very first Masters was playing quite competitively also. 6. Ron Timmerman of Tri-Par also plays at Trailer Estates weekly and has made great progress the past couple of years. 7. David H. Smith of Paradise Bay and Tecumseh, MI is in his first year of tournament play. David and Lo Ann have 3 children and 8 grands, after 46 years of marriage. He retired from Glidden Paint sales. 8. Moe Joyal of Sun City Center also placed in this tournament last season. Moe plays quietly and seems to enjoy it regularly. 1. Mary Fowler of Golf Lakes is a first year State Am. She and Larry are moving right along. She plans more tournaments next season to move up to Pro, and enjoys every step of the way. 2. Sandra Kolasinski of Massachusetts and Village on the Greens has shuffled about 12 years. Sandra has 3 children, 5 grands, and 4 great-grands. Her hobbies are reading, knitting, and bingo. Happy with her many shuffling friends, and as a new Pro looks forward to shuffling with the �Big Boys and Girls� next season. 3. Dian Darrah of Paradise Bay and New England is in training to become a tournament director. She also works at a music camp in summer. 4. Barbara Young of Trailer Estates and Beaverton, MI retired from the Saginaw Newspapers. Her daughter is from Saginaw and her 2 sons are in Arkansas. She enjoys shuffle and is a faithful volunteer at Fun Games at T.E. 5. Rita Marderosian is Mrs. Frank Marderosian, and they are faithful supporters of �Tuesday Night Shuffle� at Golf Lakes. 6. Janice O�Sullivan lives at Sea Breeze out near Cortez, and shuffles regularly in District tournaments. 1. Rick Hall also won this same place last year as a member of Bradenton Shuffle Club. He is a businessman in PA , a famed race car driver and even plays golf. He and his wife, Cheri Wargo watch others play and learn a lot. Rick also teaches others to play and plays himself at their residence courts at River Isles in Bradenton. Congratulations! 2. Tony Souza is a very strong fellow who plays gently and well. 3. John Hechinger of Bradenton Shuffle Club played in the District Amateur Masters last year and is a good sport. John is a Navy Veteran of the Vietnam conflict and has shuffled since 2015. 4. Jim Lessard of Ellenton Gardens and Salem NH played in the State Am Division last season and appears to be advancing. He was in District Amateur Masters in 2017. 5. Richard McCowan, now of Golf Lakes, is improving his home after a couple of years� absence due to family health issues. We are all pleased to welcome them back. 6. Bill Bierema at age 91 will be a Pro on Oct. 1, 2019. He has had a good year and possibly is as excited as any of us to see October come. 7. Scott Fenimore at 81 has shuffled since 2009 and says he enjoyed every minute of competition and is thankful to know so many nice people. Scott first shuffled at a campground in the Central District. 8. Frank Marderosian, veteran player at Golf Lakes � even a past president there, -prefers not to become a Pro because of league play. 1. Arlene McCague of Palmetto and Defiance, OH has shuffled for 10 years. Arlene keeps a list of every partner with whom she ever played and she thanks them all for their support. 2. Cheryl Putnam of Trailer Estates and Michigan is secretary of Trailer Estates Shuffle Club. She is also active in Michigan Shuffleboard and helps husband Tom care for Trailer Estates courts as well. 3. Lois Wegner of Tri-Par and Wisconsin is a Green Bay Packer fan like her late husband Al. Lois has also been very loyal over the years to the Trailer Estates � Tri-Par Interpark Games on Wednesdays. 4. Shirley McCullough of Trailer Estates and Owasso, MI has been inspired by her sister Rita Coy to become an avid competitor. Shirley is a member of the FSA Hall of Fame. 5. Cindy Slaughterbeck of Trailer Estates and Bluffton, OH is fully employed yet in IT for hospitals, even while serving as President of the TESC. 6. Evelyn White of Ridgewood, widow of the late Raeburn White is surely one of the District�s best shufflers in her age bracket. 7. Donna Schultz of Cincinnati, OH is a retired teacher who plays out of Bradenton Shuffle Club. She also plays in OH. 8. Linda Wallingford of Bradenton Shuffle Club, and her husband Vern always have an attractive car. They love both cars and shuffling. Marlene Coburn of Trailer Estates served faithfully every day as Pro Ladies alternate. Marlene is a member of the FSA Hall of Fame. 1. Tom Putnam of Trailer Estates and Michigan made an outstanding shot on his last disc in skill shots to place first in a very strong competition by the Pro Men. Tom is 1st Vice President at T.E. and works tirelessly on courts, discs and more. 2. Larry Mardis, Bradenton Shuffle Club and Cincinnati area of OH is a steady competitor, steady friend, and good leader. He is a retired dentist and helps others find office space in SW OH. 3. Jerry Stannard, Past President of SWCD, chair of SWCD Hall of Fame, and veteran of the Central District has shuffled on 2 family courts on Long Island Sound in CT. Jerry�s father Gilbert Stannard passed away this year at 105 years and one month. Jerry should get a star in his crown for care-giving. 4. Ed Leonard of Tropic Isles thinks the Masters is a great way to finish the season with shuffleboard friends, and is looking forward to an exciting season in 2019-2020. 5. Ron Nurnberger, retired school administrator from Michigan is a Past President of SWCD and current President of Bradenton Shuffle Club and a member of the FSA Hall of Fame. 6. Grant Childerhose of Golf Lakes and Ontario, Canada has played well for many years in the SWCD. 7. John Mickle of Trailer Estates and Ontario shared this place with Dwayne Cross of Bradenton Shuffle Club and Michigan. Dwayne was Alternate. 8. John Roberson of Golf Lakes and Ohio, former Seminary classmate of this columnist, Retired Clergy and frequent Shuffleboard Chaplain is a gracious player, win or lose. His presence in the Masters is testament to solid play week after week. This column salutes all the above and invites new people to enjoy one of the greatest sports anywhere. Additional results: FL P-25 at Lakeland March 18-19. Men Main: 3. Tom Putnam & partner. Consolation: 1. Stan Kowalewski & partner. Today, Wednesday, March 20 is the first day of 3 � days of Southwest Coast District Masters Tournaments at Trailer Estates. Beginning at 9:00 a.m. today the top 8 players in each of six divisions will play non-walking singles for the next 3 � days, ending about Saturday noon followed by the awards ceremony. The divisions are Ladies and Men for the Pros, Ladies and Men for State Amateurs, and Ladies and Men for the District Amateurs. Careful spectators can learn much by paying attention. Trailer Estates has grandstand comfort in the shade where much play is visible. The FSA Website has the eligibility list, based on the above rules. So if you have placed you are eligibile to play. Anybody can spectate (Sebring has some grandstand} and so come and play or watch. Remember that the proverb �use it or lose it� applies. In other words, you help our sport just by showing up, and many may be eligible without realizing it, for the Amateur Division is new and something of an experiment. Hope to see you there!
. Planning ahead � April 1-4, FL P-27 at Betmar in Zephyrhills � a even more spectacular and exciting. Save the dates.
. Sebring will be open to allow practice � 1-4 p.m. Sunday, March 24 in case you hope to play in the Tournament of Champions on Monday, March 25. FL P-23B at Betmar, March 4, M/L Doubles, 75 pts. Men Main: 2. Dave Kudro and partner. Consolation: 1. Ron Nurnberger-Larry Mardis. B-23A at Ft. Pierce, M/L Doubles, 75 pts. Ladies Consolation: 3. Flo Kowalewski and partner. SWCD D-20 at Trailer Estates, March 7 Mixed Doubles, 75 pts. Main: 1. Arlene McCague-Bob Kendall, 2. Marilyn Everett and Jerry Everett, 3. Lois Wegner-Ralph Lozano, 4. Ron and Pam Nurnberger. Consolation: 1. Letha DeVries-Grant Childerhose, 2 John Mickle-Cindy Slaughterbeck, 3. Tom and Cheryl Putnam, 4. Marlene Simpson-J. R. Rathburn. SWCD A-16 at Trailer Estates, March 8, Any Ams/Any Doubles, 75 pts. Main: 1. Jim Lessard-Norman Goodwin , 2. Gordon Fethke-Stan Bush, 3. Fernand Montplaisir-Donald Cadotte, 4. Ursala Joyal-Rita Marderosian. Con solation: 1. Richard McCowan-Neal Baum, 2. Ann King-Frank Marderosian, 3. Rosalie Walker-Sandra Kolasinski, 4. Alan Heimbaugh-Murielle Lamy. Thursday, March 14, (Rain Date) finish SWCD D-10 (from Golf Lakes) at Bradenton . Also A-7, 16/75, Single Mingles. Friday, March 15, Restart SWCD D-11 at Bradenton, Open M/L Doubles, 75 pts. Also A-8. Open to all, even if you were not present on Dec. 20. Next Monday, March 18, FL P-25at Lakeland, Open M/L Doubles, 75 pts. Reminder: Open to all.
. Last week�s column which saluted the valiant behind �the-scenes contributions of Mabel Sue Daidone failed to observe the fact that both Sue and Chuck Daidone are standing members of the Southwest Coast District Hall of Fame. Chuck was so honored because of the fact that he was legally blind during his shuffleboard career, he used a small telescope to see the goal, and played faithfully as long as health permitted, and played very well considering his handicap. Both have many friends across the Distrct.
. Although registration was less than last season, SWCD D-20 was a spirited, well played contest with several surprises and some new names placing as well. And so went A-16 as well. Past District President Jerry Stannard believes many players could learn more as spectators at tournaments.This would also apply to the Masters coming up March 20-23, at the end of which will also be the annual installation of new members in the SWCD Hall of Fame. Perhaps unknown to some readers � even some shufflers who only began in the last seven or eight years- this column salutes the valuable work being done behind the scenes in promotion of shuffleboard by Sue Daidone. The story begins in Lancaster, PA where Sue graduated from High School and married Chuck in June to whom she had been engaged for several months. Their family now includes two sons and one daughter. Chuck became a photo engraver and his work took them several places before his retirement in New Jersey after which they first landed at Sun�Fun in Sarasota. They moved to Ridgewood in 1992 where Sue began to shuffle. Sue played in the Southwest Coast District Amateur Masters in 1998, and Chuck did so in 2001. Little known to many, Chuck Daidone is a cousin to Anna Nuttall, and influenced the Nuttalls to begin shuffling. Al Nuttall even became President of SWCD and both played actively for several successful years. Over the years Sue gradually became active on the Internet and was the District person who kept track of who was sick or needed our help in any way. Gradually she began to publish news articles and eventually now sends over 100 people the personal news of significant needs, achievements, etc. This promotion, all tastefully written, has helped many to keep up with our sport. Her website is at mabelsue@comcast.com . Sue has taken part in the Saturday night Shuffleboard Social Club at Bradenton. They play next on March 16 from 6-9 p.m. It is open to all. You might like to try their brand of play, Sue also plays in a league and she surely does all she can to enjoy helping everybody have a good time shuffling. Feb. 25 FL P22B at Lee County Mixed Doubles 75 pts Consolation 1. Terri Smith-Dave Kudro. Feb. 28, SWCD D-19 at Palmetto, M/L Doubles 1 player minimum Dist. Am. 16/75 pts. Men Main: 1. Bill Hollabaugh-Dewey Merdeath, 2. Arnie Congdon-Norman Goodwin, 3. Ed Leonard-Gary White, 4. Faren VanDeGrift-Alvin Cunningham. Consolation: 1. John Roberson-Moe Joyal, 2. Michael Sadler-Dwayne Cross, 3. J.R. Rathburn-Bill Fowler, 4. Bob Kendall-Peter Aylen. Ladies Main: 1. Jill DeBruyne-Diane Fielbrandt, 2. Marlene Simpson-Arlene McCague, 3. Cindy Slaughterbeck-Sandy Little, 4. Ursala Joyal-Joan McCurdy. Consolation: 1. Sandra Kolasinski-Rosalie Walker, 2. Siggy Gudzus-Karen English, 3. Pat Tomko-Paula Maltby, 4. Judy Cross-Sandy Zaritz. March 7, SWCD D-20 at Trailer Estates Open Mixed Doubles, 16/75 pts. No lunch. March 8, SWCD A-16 at Trailer Estates, Any Ams/Any Doubles, 16/75 pts. No lunch. Next Monday, March 11,FL P-24A at Clearwater, Open M/L Doubles. 75pts. No lunch. Also FL P-24B at Avon Park, Open M/L Doubles, 75 pts. Lunch available. Monday, March 11, FL A-22A at St. Cloud, Any Ams/Any Doubles, 75 pts. Lunch available. Also FL A-22B at Clearwater, Any Ams/Any Doubles, 75 pts. No lunch.
. The SWCD Open Board Meeting March 2 lacked a quorum � too many Club Presidents and a couple of officers were absent � so the election of officers waits until November. Forty-five players on seven courts at Bradenton last Saturday, Feb. 23 sharpened their skills with help from about a dozen �Professors�, mostly Pros. Each student was helped to move forward in their development as a competitor by those best able to assess any deficiencies and provide help. Historically, several of those students have gone forward in tournament play and enjoyed their progress. All were encouraged by Florida President Dave Kudro and Bradenton Shuffle Club President Ron Nurnberger. The �Dean� of the school was proud of all present. We offer to hold a school at the invitation of Clubs who need help. Call 941 756-8548 to schedule a school for your park or area, yet this season or next season. FL P-21A at Trailer Estates, Feb. 18, DeSoto Doubles Open M/L Doubles, 75 pts. Men Main: 2. John Mickle-John Roberson, 3. Mike Marquis and partner, 4. John L. Brown and partner. Consolation: 1. Gilbert Broadhead-Tom Putnam, 2. Dan Lake-Jean Wilson, Jr., 3. Jerry Stannard-Dave Minnich, 4.Bill Batdorff-Vern Wallingford. Ladies Main: 1. Marlene Coburn-Terri Smith , 2. Pam Nurnberger and partner, 4. Elaine Antaya-Joan McCurdy. Consolation: 1. Flo Kowalewski and partner. SWCD D-18 at Bradenton Tropical Palms, Feb. 21, M/L Doubles, 75 pts.Ladies Main: 1. Terri Smith-Flo Kowalewski, 2. Pam Nurnberger-Donna Schultz, 3. Shirley McCullough-Adriana Cramton, 4. Jill DeBruyne-Eva Mae Lake. Consolation: 1. Cindy Slaughterbeck-Ann Dirkse, 2. Kay Lynn Duncan-Joan McCurdy, 3. Siggy Gudzus-Marilyn Everett, 4. Janice O�Sullivan-Helen Lunsford. Men Main: 1. Jerry Stannard-John Roberson, 2. Larry Mardis-Dwayne Cross, 3. Grant Childerhose-Phil Booher, 4. Jim Smith-David Welsh. Consolation: 1. Ron Nurnberger-Larry Taylor, 2. John L. Brown-Stan Kowalewski, 3. Vern Wallingford-Bill Batdorff, 4. Bill Bierema-Richard McGowan. SWCD A-15 at Bradenton Tropical Palms Feb. 22 Draw Doubles Any Ams: Main: 1. Larry Russell-Fernand Montplaisir, 2. Mike Collins-Joseph Sciortino, 3. Ken Maxwell-Janice McMillan, 4. Frank Marderosian-Greg Marchen. Consolation: 1. Don Cadotte-Janet Eisses, 2. Rita Marderosian-Ursula Joyal, 3. Gordon Fethke-Maurice Joyal, 4. Wayne Stewart-John Watts. Tomorrow, Thursday, Feb. 28 at Palmetto SWCD D-19 M/L Doubles, Minimum One District Am On Every Team, 16/75,Partner Required, Lunch Available. Next Monday, March 4, FL P-23A at Ft. Pierce, P-23B at Zephyrhills Betmar Open M/L Doubles, 75 pts, Lunch Available at Betmar. Also March 4, FL A-14 at Sebring, Any Ams/Any Doubles, need partner, 75 Pts, Lunch Available.
. Saturday, March 2, 1:00 p.m. Spring Open SWCD Board Meeting, Election of Officers. All are welcome.
. President Ivan McMillen of Suncoast Shuffle League advises that the 4 Teams would welcome more teams to join. Thursdays at 12:30, Men and Ladies welcome, No Pros nor State Ams. Call President McMillen at 419 252-19618. March 25 will be a big day in Sebring, Florida. Not only FL Open Tournament of Champions begins that day, but also the first ever Tournament of Champions for Amateurs will open at the same time and place. Not to worry, Sebring has 36 courts, 20 of which are covered by a roof. Most players will remember that the Open Division is open to (1) anyone who placed in Consolation in an Open Division State Tournament this year, (2) anyone who placed in a Main Event, Open Division this season or last season, (3) anyone placing first in the Main Event, Open Division during their lifetime. The parameters for the Amateur Division FL Tournament Of Champions have only been published here once, back in October, 2018 after the Fall FSA meeting. (1) Placing once in a year in a FL State Tournament for Amateurs, an Amateur gets to play that year. (2) Placing twice gives you two years, if still an amateur. Placing thrice in a season gives an Amateur 3 years eligibility as an Amateur. To play in a State Tournament of Champions is a privilege not to be overlooked nor taken lightly. FL P20A February 11 at Golf Lakes Open M/L Doubles 75 pts. Ladies Main: 1. Pam Nurnburger and. Pt., 2. Flo Kowalewski-Terri Smith. 33. Cheryl Putnam-Pat Tomko, 4. Elaine Antaya-Joan McCurdy. Consolation�2. Mary Federation-Kathy Laver, 3. Adriana Cramton-Li nda Wallingford, 4. Judy Cross-Marilyn Everett. Men Main: 1. Larry Mardis-Larry Taylor, 2. Ron Nurnberger-Dwayne Cross. 3. Grant Childerhose-Tom Putnam, 4. John Mickle-Mike Marquis. Consolation: 1. Bob Kendall-Ben Coy, 2. Patrick Antaya-C au Huynh, 3. Jerry Everett-Faren VanDeGrift, 4. Arnie Congdon-Lloyd Schmidt. FL A-18 at Golf Lakes, Feb.12, Any Amateurs/Any Doubles, 75 pts. Main 1. Paul Maille-Dale Overzet, 2. Bill Bierema-Charles Stannard, 3. Larry and Mary Fowler. Consolation. 1. Rita and Frank Marderosian, 2. Ken Maxwell-Karl Clark. SWCD D-17 Feb. 14 at Bradenton, N o 2 Pros, 75 pts. M/L Doubles, 75. Ladies Main: 1. Evelyn White-Sandra Kolaskinski, 2. Pam Nurnberger-Ursala Joyal, 3. Terri Smith-Marilyn Rotman, 4. Cheryl Putnam-Marcia Clark. Consolation: 1. Pat Tomko-Elaine Antaya, 2. Wilma Terwilliger-Kathy Kendall, 3. Barbara Young-Shirley McCullough, 4. Adriana Cramton-Helen Lunsford. Men Main: 1. Larry Mardis-Mo DeBruyne, 2. Bill Hollabaugh-Larry Taylor, 3. Lloyd Schmidt-Tony Souza, 4. Grant Childerhose-Richard McCowan, Consolation: 1. David Evenson-Phil Booher. 2. Vern Wallingforfd-Moe Joyal, 3. Faren VanDeGrift-Al Cunningham,4. Ric k Hall-J.R.Rathburn. SWCD A-14 Feb.15 at Bradenton, A ny Ams/Any Doujbles., Main. 1. Paul Maille, 2. Frank Marderosian. Consolation: 1. Ray Lawson, 2. Ken Laver, 3. Mary Federation, 4. Larry Bennett. Tomorrow, Feb. 21, SWCD D-18 at Bradenton Tropical Palms, Open M/L Doub les, 75 Pts. Lunch Available. Feb.22, SWCD A-15 at Bradenton Tropical Palms, Any Ams/Any Doubles, 16/75 pts. Next Monday, Feb. 25, FL P-22A at Tavares Open M/L Doubles, 75 pts. Lunch Available. Also Monday, Feb. 25, FL P-22B at Lee County, Mixed Doubles, 75 pts. No lunch. Also Monday, Feb. 25 FL A-20 at Melbourne Tropical Haven, Any Ams/Any Doubles, 75 pts. No lunch available.
. Saturday, Feb. 16 FSA Winter Meeting at Sebring , the 2019-2020 season Tournament Schedule was finalized and should be available to club Presidents to reproduce and distribute later this week, it is hoped.
. Remember Shuffleboard University Saturday, Feb. 23 at Bradenton Shuffle Club. Arrive 8:30-8:40, please. This school is open to all. We offer classes for beginners, intermediate, or advanced. We will help anyone who tries to improve. Free. We recently heard the �State of the Union� address. What is the state of shuffleboard? Shuffleboard is organized at the Club level, the District level the State level, the National level, and even at the International level. The FSA Winter meeting will be Saturday, Feb. 16 at Sebri ng. The SWCD meeting will be Saturday, March 1 at 1:00 p.m. at Bradenton Shuffle Club, 1525 Ballard Park Drive. All are welcome. One observation is that too few volunteers come forward to prepare for tournaments, to play, to become directors, etc. SWCD D-16 at Bradenton , Feb. 7, Open M/L Doubles, 75 pts. Men Main : 1. Peter Berg-J.R. Rathburn, 2 Larry Mardis-Larry Taylor, 3. Bill Batdorff-Ralph Lozano, 4. Jerry Stannard-Rick Hall. Consolation: 1. Grant Childerhose-Murray Potter, 2. John Mickle-David Welsh, 3. Dwayne Cross-Bill Bierema, 4 John Heckinger-Ira Snook. Ladies Main: 1. Shirley McCullough-Arlene McCague, 2. Linda Wallingfofrd-Joan -McCurdy, 3. Elaine Antaya-Janice O�Sullivan. 4. Terri Smith-Marilyn Everett. Consolation:1. Donna Schultz-Cheryl Putnam, 2. EvaMae Lake-Sharon Olmstead, 3. Pam Nurnberger-Cindy Slaughterbeck, 4. Joan Curwin-Carol Maxwell.
. Remember Feb. 23 at Bradento n, Shuffleboard University, 9:00 A.M. to learn more. Please arrive at 8:30-8:45 to get acquainted, get ready, etc. Please register with �Dean� John L. Brown or leave word at Bradenton Shuffle Club. 747-6184. �Professors� also register with John at 756-8548. We all have memories from family, school, work and play. That popular song a couple of generations ago encouraged us to reflect upon the past. Some things we all threw away once are now valuable, and the more scarce they become, the more pricey they become. Earlier this season, this column remembered several shuffleboard memories from past decades. Today we will reflect on my own most valuable shot, a 48 point swing. Nearly two decades ago, playing at Ft. Pierce against Don Bladorn of Wisconsin and Sebring in the last shot of the tournament I was in the kitchen and Don had a 10. I had an 8-8 liner and the hammer; we were behind but not by much. I wound up and hit Don�s 10, replacing it (20 point swing); his disc touched my 8-8 liner, sending it to score an 8 (28 point swing already). His disc hit my kitchen, knocking it off (38 point swing now) and miraculously his disc stayed in the kitchen (48 point swing). Game, and tournament. Mrs. Bladorn was our score keeper, and she was so mad, that when I thanked her for her work, admitting I was lucky on the last shot, she shouted emphatically, �that if that _ _ _ _ ___ Bladorn hadn�t been on the board when he was ahead, my �lucky� shot would have been impossible! It was true, but Don was embarrassed by her outburst ,and avoided me for 6 weeks, but we later became good friends. Unfortunately, Don died in Wisconsin with 199 points, but was later put in the Hall of Fame as a Promoter, Special Award. I can use their names as none of them survive today, but there are lessons here for all of us. �Memories Are Made Of This�. FL A-16A Paradise Bay Jan. 28,Any Ams/Any Doubles. 75 pts. Main: 1. Patrick Antaya-David Evenson, 2 Dian Darrah-Ken Maxwell, 3. Elaine Antaya-Sandra Kolasinski, 4. Marijane and Gene Clark. Consolation: 1 Steve Biscontine-Marilyn Rotman, 3. Edward Nawrocki-David H. Smith, 4. Donald Cadotte- Fernand Montplaisir. SWCD D-15 at Bradenton, Jan. 31, Open M/L Doubles, 75 pts. Men Main: 1. Larry Mardis-Larry Taylor, 2 Ed Leonard-Dave Welsh, 3. Levi Miller-John Roberson, 4. Bob Kendall-Darrell Blake. Consolation: 1 Jerry Stannard-Murray Potter, 2 Grant Childerhose-Ll,oyd Sc hmidt, 3. Faren Van DeGrift-Clarence Gin gerich, 4. Ken Laver-Gordon Fethke. Ladies Main :1. Marlene Coburn-Pam Nurnberger, 2 Nancy Sclafani-Linda Wallingford, 3. Terri Smith-Marilyn Everett, 4.Donna Schultz-Jane Schram, Consolation: 1. Cheryl Putnam-Ingrid Broadhead, 2 Arlene McCague-Eva Mae Lake, 3. Adriana Cramton-Sharon Olmstead, 4. Dian Darrah-Carol Maxwell. SWCD A-12, Bradenton Feb.1: Main: 1 Patrick Antaya-John Simmons, 2. Don Trottier-M ike Colllins, 3. Frank Marderson-Paul Maille, 4. Larry Fowler-Ursula Joyal. Consolation: 1. Tony Souza-Fernand Montplaisir, 2. Mary Fowler-Moe Joyal, 3. Rita Marderosian-Janet Eisses, 4. Mary Federation-Larry Bennett. Tomorrow, Thursday Feb. 7 at Bradenton, SWCD D-16 Open M/L Doubles, 75 points, partner needed, no lunch available.
. Players wanting to attend �Shuffleboard University� Sat. Feb . 23 at 9:00, Bradenton: Mark your calendar and c all 756-8548 so we will have a �Professor� for your class.
. Potential �Professors� let John Brown know he can count on you. On Saturday, February 23 at 9:00 a. m. at Bradenton Shuffleboard Club, 1525 Ballard Park Drive(zip code 34205 for GPS), we will offer Shuffle School. If you prefer, call it Shuffleboard University. The dean is John L. Brown. There will be a professor on each court of 4 students. The first half hour will be history of this ancient sport, orientation to useful factors about it, and a glimpse of the variety of ways Shuffle is organized and played. This will be interesting and useful. We will try to meet each student where their development has brought them and encourage each one to grow in skills and strategy for their own pleasure and ability. We plan for up to one and one half hours on the court, but if you want to leave sooner or stay longer, you are free to decide. Shuffleboard is a great fraternity of ladies and gentlemen and many relationships can last a lifetime. Tuition js free and worth every bit of it. It is helpful to know how big the crowd will be, so feel free to let us know at any tournament, or call 756-8548 (John Brown), or leave word at 747-6184 (BSC). FL P-17,National Doubles at Trailer Estates, Jan.21-23, M/L Open Doubles, 75 pts. Ladies Main: 3. Arlene McCague-Cindy Slaughterback. Consolation: 1. Elaine Antaya-Joan McCurdy, 2. Siggy Gudzus-Jane Schram, 3. Marilyn Everett-Marlene Coburn, 4. Donna Schultz-Dianne Leonard. Men Main: 1. Dave Kudro- partner, 4. Larry Taylor-Larry Mardis. Consolation: 2. Ralph Lozano-John Mickle, 4. Dan Lake-Jerry Stannard. SWCD D-14 at Palmetto Jan. 24-25 M/L Draw Doubles, Restricted to State Ams and Pros, 16/75 Men Main: 1. Bill Bierema-Ralph Lozano. 2. Rick Hall-Paul Knepper. 3. Larry Mardis-Elmer Heisler. 4. Mike Marquis-J.R. Rathburn. Consolation 1. Faren VanDeGrift-John Mickle. 2. Rick McCowen-Scott Fenimore. 3. Levi Miller-Joseph Kent. 4.Phil Krick-Don Sprague. Ladies Main: 1.Evelyn White-Terri Smith. 2. Cindy Slaughterbeck-Cheryl Putnam. 3.Carol Maxwell-Janice O�Sullivan 4.Elaine Antaya-Donna Schultz.Consolation: 1. Joan McCurdy-Kathy Laver. 2. Siggy Gudzus-Arlene McCague.3. Pat Tomko-Helen Lunsford.4, Sandy Wixson-Lois Wegner. SWCD A-11 at Palmetto Jan, 25-26, Draw Any Ams/Any Doubles 16/75� Main 1. Fernand Montplaisir-Tony Souza, 2. Frank Marderosian-David H. Smith, 3. Larry Fowler-Ron Timmerman, 4. John Simmons-Donald Cadotte. Consolation: 1. Gordon Fethke-Ken Laver, 2. Jake Okuley-Moe Joyal. 3. Mary Federation-Ursula Joyal, 4. Harriet Piccard-Sandy Kolasinski. Tomorrow, Wed. Jan, 31, SWCD D-15 at Bradenton, Open M/L Doubles, Partner needed, 75 points. No lunch available. Friday, Feb. 1 at Bradenton, SWCD A-12 Any Ams/Any Doubles, State Ams need Dist. Am Partner.16/75, no lunch available. Next Mon., Feb. 4 FL P-19 at Bradenton, State-Sponsored Open Doubles M/L, 75 pts. Extra points in Main- 8-6-5-3. No lunch available. Also Feb. 4 FL A-17 at Sebring, Any Ams/Any Doubles, 75 pts.
. Marilyn Everett�s place at the National Doubles with Marlene Coburn makes her eligible for induction next year in the FSA Hall of Fame. Congratulations, Marilyn!
. Anyone may come to the school Feb. 23. Club Presidents should let members know they are welcome to attend. Happy Shuffling! One of the highlights each season is the Florida Shuffleboard Association Hall of Fame Installation. Seven were inducted January 14 at The Banquet-Country Club at East Bay in Largo, FL. Quite unusual was the fact that three were from the Northern District, three from Southwest Coast District and one from the Central East Coast District. The latter was a special award to an officer, who does not compete at the State level, but who has served many years as Secretary of the FSA. Mrs. Linda Rebholz richly deserves the honor as she does very well, indeed. From the Northern District, Glenda Brake, Allen Dronsfield and Susan McLaughlin each has a stellar record in points earned. But the Southwest Coast District made us quite proud. One was Terri Smith who has won and is winning plenty of points and is such a pleasant and humble player of whom we all can be proud. Terri is from Michigan and played in Zephyrhills of the Central District and in Ohio and North Carolina as well. Her life partner is FSA President Dave Kudro and she has a most unusual hobby � collecting 1500 different items related to Donald Duck. A most enjoyable comedy routine entertained us all as Pam Nurnberger and Ron Nurnberger, who introduced and presented each other, humorously claimed to be the most important shuffler in the family. Pam reached 200 points first and has the most points yet, but Ron has won several very big prizes too, in recent years, including a national pin which she has yet to obtain. Both have served as officers and have made good records, and are both very likable and seem equally popular. Anyway, by the time they had presented each other, everybody enjoyed the humor with which they carried each other. January 14, FL P-16 State-Sponsored Singles at Clearwater. Mens Walking Main: 2. Jerry Stannarxd, 4. Tom Putnam. Consolation: 1. Jerry Everett, 2. Larry Mardis. Men Non-walking Consolation: 1. Ron Nurnberger. Ladies Non-walking Main : 1. Pam Nurnberger. Consolation: 2. Terri Smith. January 17 at Bradenton Tropical Palms, SW CD D-13, M/L Draw Doubles, Restricted to State Ams and Pros. 16/75 points. Ladies Main: 1. Lois Wegner-Arlene McCague, 2. Donna Schultz-Cindy Slaughterbeck, 3. Linda Wallingford-Jane Sc hram. 4. Joan McCurdy-Adriana C ramton. Consolation: 1. Elaine Antaya-Pat Tomko, 2. Carol Maxwell-Kathy Laver, 3. Evelyn White-Cheryl Putnam, 4. Siggy Gudzus-Janice O�Sullivan. Men Main: 1. Larry Mardis-John Roberson, 2. Jerry Stannard-J.R. Rathburn, 3. Joseph Kent-Rick Hall, 4. David Evenson-Levi Miller. Consolation: 1. Jerry Everett-Gilbert Broadhead, 2. Murray Potter-Larry Taylor, 3. Ken Maxwell-Ira Snook, 4. Elmer Heisler-Terry McNamara. January 18 at Bradenton Tropical Palms, SWCD A-10 Any Ams/Any Draw Doubles , 16/75 points. Main: 1. Mike Collins-Don Trottier, 2. Tony Souza-John Simmons, 3. Jim Lessard-Wayne Stewart, 4. Gordon Fethke-Mary Fowler. Consolation: 1.Joe Sciortino-Larry Fowler, 2. Sandra Kolasinski-Ron Timmerman, 3. John Watts-Karl Clark, 4. Moe Joyal-Rita Marderosian. Thursday, Jan. 24 at Palmetto, SWCD D-14, M/L Draw Doubles, Restricted to State Ams and Pros. 16/75 points. Lunch. Friday, Jan. 25 at Palmetto, SWCD A-11, Any Ams/Any Draw Doubles. 16/75 Points. State Ams will have District AM Partner. Draw Doubles no partner required. Lunch. Next Monday, Jan. 28, FL P-18A at Betmar M/L Doubles, 75 pts. Lunch. Also Monday, FL P-18B at Country Village East in the Southeast Coast District, M/L Doubles, 75 points. No lunch. Also Monday Jan. 28 FL A-16 at Paradise Bay, Any Ams/Any Doubles, 75 points. No lunch. Al,so FL A-16B at Hawthorne, Any Ams/Any Doubles, 75 points. Lunch. .All three of SWCD 2019 Hall of Fame inductees placed Tuesday, including Pam Nurnberger with First place in Ladies for three years in a row. Also placing well that day was Larry Mardis, who will be inducted next year in Bradenton as SWCD hosts the 2020 Hall of Fame Banquet.
. Plans for a Shuffleboard School are on hold until a date is confirmed. The delay is partly the result of an upcoming Saturday FSA Meeting to finish business postponed from Jan. 14. Hopefully we can set the date by the deadline for the next column. Leaders should be encouraging club members to plan to attend this school to be held at Bradenton as soon as is practical, or to survey club members who might want a school in their park on some future date. The January SWCD Open Board meeting was well attended and was amicably led by our new President Steve Slaughterbeck, who was suddenly moved up by the health concerns of our now Past-President Jerry Stannard, who ably led us in recent years. Many of the issues involved future tournament affairs. 1. Bradenton Tropical Palms declines to host future tournaments, a tragedy to those who appreciate their excellent meals available for so many years; the former Bradenton Trailer Park history as the oldest trailer park in Manatee County, started by Kiwanis in the 1930�s, and now newly constructed roof covers over the players in very recent times. It is anticipated that Palmetto will receive D-18 and A-15 in March 2020; Golf Lakes may get D-6 and A-3 in November 2019; and Bradenton Shuffle Club will host D-13 and A-10 in January 2020. This column salutes Bradenton Tropical Palms for great memories over the past 8 decades. All this change will be in the 2019-2020 Tournament Schedule. 2. The Rain Date of March 14 will see the finish of SWCD D-10 in the morning at Bradenton Shuffle Club. At 1:30 p.m. that day Bradenton will host the annual SWCD Hall of Fame induction ceremonies. 3. On Rain Date March 15, the rained-out never started D-11 and A-8 will be played at Bradenton Shuffle Club. Also note that all eligible players are eligible on March 15, even if you never came to register on that bad weather day. This is an exception to the usual rule that a rain date is only open to those who were registered on the original day. 4. It was affirmed that D-17 at Bradenton, the popular No 2 Pros will have no move-up points, but will have Master Points. Jan. 7, FL-15B at Lee County, M/L Doubles, 75 points. Ladies Main: 2. Flo Kowalewski and Partner, 3. Terri Smith-Pam Nurnberger. Consolation: 2. Donna Schultz-Dian Darrah 3. Marilyn Everett-Marlene Coburn. Men Main: 2. John Mickle-Tom Putnam, 3. John L. Brown and partner. Consolation: 1. Dwayne Cross-Larry Mardis. Jan. 10 at Golf Lakes, SWCD D-12, Open Doubles, M/L, 16/75 points. Ladies Main: 1. Terri Smith-Pam Nurnberger, 2. Elaine Antaya-Joan McCurdy, 3. Arlene McCague-Carol Maxwell, 4. Cindy Slaughterbeck-Cheryl Putnam. Consolation: 1. Marlene Coburn-Marilyn Everett, 2. Janice O�Sullivan-Helen Lunsford, 3. Shirley McCullough-Adriana Cramton, 4. Letha DeVries-Doris Mularz. Men Main : 1. Larry Mardis-Faren VanDeGrift, 2. Gilbert Broadhead-Larry Taylor, 3. Tom Putnam-Ed Leonard, 4. John Hechinger-John L. Brown. Consolation: 1. Bob Kendall-Jim Rathburn, 2. Bill Batdorff-Vern Wallingford, 3. Bill Comford-Cau Huynh, 4. Dan Lake-Patrick Antaya. Jan. 11 at Golf Lakes, SWCD A-9, Any Amateurs/Any Doubles, Mingle/Mingle, 16/75 points. 1. Don Cadotte-Charles Stannard, 2. Neal Baum-Larry Fowler 3. Rick Hall-Peter Aylen, 4. Ron Timmermman-Sandra Kolasinski. Consolation: 1. Janet Eisses-Don Trottier, 2. Rita Marderosian-Ed Nawrocki, 3. Kathy Kendall-Dale Overzet, 4. Karl Clark-Mary Fowler. SWCD D-13 , Jan, 17 at Bradenton Tropical Palms, M/L Draw Doubles, 16/75 points, Lunch available. No partner required. SWCD A-10, Jan. 18 at Bradenton Tropical Palms, Mingle/Mingles, 16/75 pts. Lunch. No partner needed. Jan. 21, FL P-17 at Trailer Estates, National Doubles, M/L, 75 points. No lunch. Jan. 21, FL A-15A at Riverwoods, P-15B at Zephyrhills, Any Ams/Any Doubles, 75 points.
. Congratulations to Dr. Larry Mardis, winter resident of Braden Castle, who now plays out of Bradenton Shuffle Club, and who earned his 200th Florida Masters Point last week at Lee County Shuffleboard Club at North Ft. Myers, making him eligible for induction into the FL Shuffleboard Hall of Fame next year.
. The Southwest Coast District needs new volunteers to become Shuffleboard Tournament Directors. After being trained Directors earn modest income and perform a valuable service to the greatest sport in the world. Tournament Directors do not have to be shuffleboard players. Anyone interested may contact any SWCD officer or respond by calling 756-8548.
. Plans are being made to offer a shuffleboard school in the very near future, probably on a Saturday at Bradenton Shuffle Club. If any club has several who want to improve their skills, strategy and knowledge we can bring a school to your park, as well. You are welcome to call 756-8548 for further information.
. The Bradenton Social Shuffle Club begins Winter Shuffle for this season at Bradenton Shuffle Club Saturday, Jan. 19 at 6-9 p.m. All are welcome. It is fun, not a contest. They have the equipment and are willing to help interested parties. Optional donation $5. Bradenton Shuffle Club President Paul Knepper 84, is resigning after two decades of service, about the last half of which he was Club President. Paul and his devoted wife Lee, to whom he has been happily married for 47 years, plan to return to New Haven, IN, a suburb of Fort Wayne to enjoy life together as long as possible. Ron Nurnberger who will succeed Paul as President, says that no one person can replace Paul. Ron says Paul spends about 40 hours per week to keep the Club humming, and it will take all the club members to fill his shoes. The Kneppers arrived in 1999 and began to help then-President Joe Woda with Club efforts. Paul Knepper had spent many years in Indiana as a sheet metal worker, and before that retirement greatly enjoyed working stainless steel, especially in kitchens. Paul has greatly appreciated the friendship of the shuffleboard fraternity. It was Ken McLaughlin who came to Leisure Lakes and asked Paul to be his partner thus getting him into tournament competition. A pleasant memory was when Paul Knepper and Niles Kenyon tied first in the SWCD Amateur Masters in 1999. Niles won the playoff. Paul also played with Jim Miller back then and felt Jim helped him a lot. Paul and the Millers are responsible for many upgrades to the Bradenton Shuffle Club. Paul considers Jim Miller the prototype of one who helps the sport, and especially helped Bradenton Shuffle Club. Wednesday, Jan. 2 at Sebring, FL P-14A, M/L Doubles, 75 points. Ladies Main: 1. Pam Nurnberger and partner. Men Main: 1. Larry Mardis-Levi Miller, 3. Bob Comford-Jerry Stannard. FL P-14 B at Clearwater, M/L Doubles, 75 points. Ladies Main: 1. Cheryl Putnam-Joyce Marquis, 2. Marlene Coburn-Terri Smith, 4. Marilyn Everett-Shirley McCullough. Ladies Consolation: 4. Flo Kowalewski and partner. Men Main: 1. Dave Kudro and partner, 2. Dwayne Cross-Jerry Everett, 4. Dave Minnich and partner. Consolation: 3. Tom Putnam-John L. Brown. FL A-11 at Clearwater, Jan. 2, State Sponsored Any Ams/Any Doubles, 75 points. Main: 3. Cau Huynh-Paul Johnson. Tomorrow, Jan. 10, 2019, SWCD D-12 at Golf Lakes, Open M/L Doubles, 16/75 points. Also Thurs, Jan. 10 at Port Charlotte, FL A-13 (Thursday Start) Any Ams/Any Doubles, 75 points. Friday, Jan. 11 at Golf Lakes, SWCD A-9, Mingle/Mingle, 16/75 points. Next Monday, Jan. 14 at Clearwater, FL P-16 State-Sponsored Open Singles, M/L, W/NW. Clearwater will have lunch available. Hall of Fame Banquet. Winter FSA Meeting. Also Monday, Jan. 14, FL A-14 at Avon Park, Any Ams/Any Doubles, 75 pts.
. Gilbert Stannard, father of shufflers Jerry and Charles, passed away Sunday, January 6 at age 104. Gib owned two shuffle courts in Connecticut on Long Island Sound, and taught all his family and friends to play. He continued to play until about age 102. Our sympathy to his 2 sons and 2 daughters and their families.
. SWCD Open Board Meeting Saturday, January 12 at Bradenton Shuffle Club, 1:00 p.m. All welcome, anyone may speak. Voting are SWCD Board and Club Presidents.
. Cheryl Putnam�s First Place in Main at Clearwater gives her lifetime eligibility for Pro Tournament of Champions. Serving as 1st Vice President of the Southwest Coast District of the Florida Shuffleboard Association was to prepare Steve Slaughterbeck to assume the Presidency about one and one-half seasons from now, but the resignation of President Jerry Stannard for health reasons has handed the Presidency to Steve Slaughterbeck now. Slaughterbeck, of Bluffton, OH, a 63 year old Auctioneer and Real Estate Dealer, has already served four years as President of the Bluffton Shuffle Club, and has served as co-president of Trailer Estates as well. And, his wife Cindy is President at Trailer Estates now. So this move is hardly overwhelming, due to these circumstances. In fact shuffleboard has kept him so busy these past 5 years that he hardly has time to use his Florida licenses as auctioneer or in real estate. President Steve Slaughterbeck hopes to promote shuffleboard, encouraging more people to learn and play often. He also expressed appreciation for Past President Ron Nurnberger�s encouragement in making a smooth transition. This reporter also offers help and support as a past president of Trailer Estates, SWCD and present State Delegate which will enable us to travel together to State Meetings, etc. Welcome aboard, President Steve. Wednesday, Dec. 26 at Bradenton, FL P-13, M/L Open Doubles, 75 points. Men Main: 1. Larry Mardis-Larry Taylor, 4. Jerry Everett-Dave Minnich. Consolation: 1. Bill Batdorff-Faren VanDeGrift, 4. Gerry Johnson-John Simmons. Ladies Main: 1. Terri Smith and partner, 2. Flo Kowalewski-Pam Nurnberger, 4. Pat Tomko-Cindy Slaughterbeck. Consolation: 2. Letha DeVries-Kathy Boutwell, 3. Marlene Coburn-Marilyn Everett. Today, Jan. 2, FL P-14A at Sebring, P-14B at Clearwater, M/L Open Doubles, 75 points. Also Today, Jan. 2 FL A-11 at Clearwater, State Sponsored , Any Ams/Any Doubles, 75 points. Next Monday, Jan. 7, 2019, FL P-15A at St. Cloud, P-15B at Lee County, M/L Open Doubles, 75 points. Also next Monday, Jan. 7, FL A-12 at Lakeland, National Amateur Singles, Non-walking, M/L/ 12 frames.
. Next Thursday, January 10, SWCD D-12 at Golf Lakes, Open M/L Doubles, 16/75 points. (Published early as partner needed, courtesy to snowbirds possibly arriving without schedule or partner).
. Error Correction: Rained out SWCD D-10 postponed to March 14. Mis-stated in Dec. 26 column. Possible Discussion Jan. 12 at Open Board Meeting.
. Saturday, Jan. 12, 1:00 p.m. at Bradenton, SWCD Open Board Meeting.
. Since D-10, A-7, D-11, A-8 all rained out, discussion will doubtless occur Sat. Jan.12. This column will report. All welcome Jan. 12. Presidents urged to attend. Happy New Year and Happy Shuffling. SWCD. D-11, A-8 Am D-10 postponed to be finished on March 14. D-11 will be played March 15 in its entirety. In an Amateur Tournament on November 21, 2008 Arlene McCague and J.R. Rathburn faced Vern Wallingford and Joe Kent. In the last frame Arlene and Joe were opposed and the scoreboard showed Joe 69, Arlene 51. Arlene had one on and Joe hid one behind hers, reaching 76. Joe kept putting one on in front and Arlene nudged it on the line, scoring another. Joe felt so confident he was the victor at 76 that he failed to notice her added scores, three 7�s and an 8, came to 80 at the end. All were reminded that the scoreboard is your silent partner, requiring your constant attention. Arlene and J.R. won, 80-76. Spectators can also learn from paying attention at times like that. This column appreciates players submitting items for readers to enjoy. Monday, Dec. 17 at Ft. Pierce, FL P-11A, Ladies Main: 3. Flo Kowalewski and partner. Men Consolation: 4. Stan Kowalewski and partner. FL P-11B at Betmar, Men Main: 1. Ron Nurnberger and partner. Monday, Dec. 10 at Palmetto, FL A-8A, Any Ams/Any Doubles, 75 points, Best 2 of 3 games. Main: 1. David Evenson-Patrick Antaya, 2. Larry Fowler-Frank Marderosian, 3. Sandra Kolasinski-Don Trottier, 4. Kathy Kendall-Peter Aylen. Consolation: 1. Jim Lessard-Tony Souza, 2. Delmer Kohorst-Carl Kohorst, 3. Harriet Piccard-Walter Yoeckel, 4. Rita Marderosian-Mary Fowler. SWCD D-10 at Golf Lakes rain delay to Rain Date March 18, 2019. Thursday , Dec. 20 at Bradenton Shuffle Club, SWCD D-11 Open M/L Doubles, 75 points, bring partner no lunch available. Friday, Dec. 21 at Bradenton, SWCD A-8, Any Ams/Any Doubles, 16 frames/75 points. No 2 State Ams on one team. No SWCD tournaments Christmas week or New Year�s First week.
. Jerry Stannard is playing again after a hospital stay. Gib is thriving at Summerfield at age 104.
. Ron Nurnberger observes it has taken much time and effort to achieve the required 200 FL Pro points for the FSA Hall of Fame, but the fact that he and Pam will be inducted together on Jan. 14 makes it especially worthwhile. This columnist is unaware of any couple previously inducted together in Florida Shuffleboard Association history. Congratulations! At the well-attended Florida Shuffleboard Association�s President�s Trophy Tournament at Lakeland December 3, awards of Pins and Certificates were given to nearly 50 players according to last season�s accomplishments. Gold Medal winners from the Southwest Coast District included the late Jim L. Miller, Ron Nurnberger, Dave Kudro, Pam Nurnberger, and Terri Smith. Silver Medals went to Dave Minnich and Flo Kowalewski. Bronze Medals went to Mike Marquis, Dwayne Cross, Ralph Lozano, and Joyce Marquis. Pins honoring placement in the 2018 Florida Masters Tournament were given to Pam Nurnberger, Terri Smith, Jim L. Miller, Ron Nurnberger and Dave Kudro. The only first place pin won by a SWCD player was Pam Nurnberger. Well done, Pam! FL P-10, President�s Trophy Tournament, Dec. 3., Open Mixed Doubles. Main: 3. Joyce and Mike Marquis. SWCD D-9 at Palmetto, Dec. 6-7, Open M/L Doubles, 75 points. Ladies Main: 1. Jill DeBruyne-Dian Darrah, 2. Arlene McCague-Carol Maxwell, 3. Shirley McCullough-Pat Tomko, 4. Terri Smith-Marilyn Everett. Consolation 1. Cheryl Putnam-Cindy Slaughterbeck, 2. Martha Kaufman-Marlene Simpson, 3. Janice O�Sullivan-Helen Lunsford, 4. Donna Schultz-Joan Curwin. Men Main: 1. Ron Nurnberger-Mike Marquis, 2. John Mickle-Ed Leonard, 3. Lowell Williams-Phil Booher, 4. Gerry Johnson-John Simmons. Consolation: 1. Tom Putnam-Gil Broadhead, 2. Grant Childerhose-Murray Potter, 3. Levi Miller-John Roberson, 4. Scott Fenimore-Bill Bierema. SWCD D-A at Palmetto, Friday, Dec. 7, Mingle/Mingle, 16/75 points. 1. Ursala Joyal,, 2. Rita Marderosian, 3. Tony Souza, 4. Dave Evenson,, 5. Jim Lessard, 6. Dave Patchkowski 7. Sandra Kolasinski, 8. Maurice Joyal. Thursday, Dec. 13 at Golf Lakes, SWCD D-10, M/L Draw Doubles, Restricted to State Ams and Pros, 16/75 points. No lunch available. Friday, Dec. 14 at Golf Lakes, SWCD A-7, Mingle/Mingle, 16/75 points. No partner required, no lunch. A few years ago, Bob Comford and Larry Fowler were playing Ron Nurnberger and Gilles Emard. Gilles had two yellow 8�s,and one seven, with a black kitchen, 33 points. Larry had the hammer. He shot to take off both 8�s and hope for the best. When the dust cleared, Larry Fowler had a black 8, and a 7, with a yellow 10 off, 25 points to the good. From 33 points for Gilles Emard to 25 points for Larry Fowler resulted in a 58 point swing on his hammer. Pretty good for at that time, Larry Fowler was still a District Amateur. Thanks to Ron Nurnberger�s great memory, helped by the fact that Ron sent that news back then to �The Shuffler�, as he does occasionally yet. His contribution to this article was stimulated by comments on last week�s �Six Tens in One Game�. Readers are regularly welcome to make contributions for others to enjoy. On January 9, 1996, as a State Amateur playing in the 1996 Men�s National Amateur Non-Walking Singles at Winter Haven, this happened to me. Four of the tens were fortunate enough to have backstops. In the other two, the board was blocked leaving only the ten as a possible target. So sixty of my seventy-five points required for the wins were tens. FL P-08B at Bradenton, Nov. 19-20, M/L, 75 points. Ladies Main: 1. Pam Nurnberger-Joyce Marquis, 2. Nancy Sclafani & partner, 3. Terri Smith-Marilyn Everett, 4. Jill DeBruyne-Kathy Laver. Consolation: 1. Arlene McCague-Kay Lynn Duncan, 2. Lois Wegner-Marlene Coburn, 3. Adriana Cramton-Siggy Gudzus, 4. Linda Wallingford-Donna Schultz. Men�s Main: 1. Dave Kudro & partner, 2. Ron Nurnberger-Mike Marquis, 3. Larry Mardis-Larry Taylor, 4. Bill Comford-Gerry Johnson. Consolation: 1. Elmer Heisler-Phil Booher, 3. Faren VanDeGrift-Ben Coy, 4. Joseph Kent-Phil Krick. The Southwest Coast District of the Florida Shuffleboard Association often dares to try something new. SWCD D-7 at Trailer Estates Thursday, Nov. 15-16 was an experiment. The plan was to play Mingle/Mingles,, drawing for a spot on a court each game for 3 games in the morning and 3 more games in the afternoon in both the men�s and ladies divisions on the first day. Then the 16 players with the most wins in each division would be eligible to play the second day in the more familiar format of semi-finals and finals, playing doubles 75 points, 2 of three games. Rain the first afternoon shortened the day to 3 games for most players. A wish to finish on Friday caused the directors to shorten the first phase to 5 games, then go to the second phase played Friday afternoon, and finally all was finished at 7:00 p.m. The top 8 players in each Division drew for a partner in the Main, and the next 8 with most wins drew for a partner in Consolation. A sound majority of those reporting their experience thought it was successful enough, even with shortening due to rain, that it should be tried in at least one such event next season. On the positive side, many liked playing with different players making new acquaintances and some new friends. Also the novelty appealed to some players. The leaders were pleased that despite the weather challenges, such a good time was had by so many. On the down side, a few felt somewhat puzzled, feeling that we should stick to more conventional formats for most tournaments. Monday, Nov. 12, FL P-7A at Bradenton, M/L Doubles, 75 points. Ladies Main: 2. Joyce Marquis-Nancy Sclafani, 3. Marlene Coburn-Marilyn Everett, 4. Pam Nurnberger & partner. Consolation: 1. Terri Smith & partner, 3. Pat Tomko-Cheryl Putnam. Men Main: 1. Ron Nurnberger-Mike Marquis, 2. Faren VanDeGrift-Ben Coy, 3. Dave Kudro & partner. 4. Larry Mardis-Larr y Taylor. Thursday, Nov. 15 SWCD D-7 at Trailer Estates, Mingle/Mingles, 16/75, Second day 75 points, 2 of 3 games, M/L Doubles. Men Main: 1. Larry Mardis-Dave Evenson, 2. Tom Putnam-John Mickle, 3. Bob Kendall-Ira Snook, 4. Faren VanDeGrift-Scott Fenimore. Consolation: 1. Phil Booher-John Roberson, 2. Bob Comford-Joe Kent, 3. Brad Thomas-Ron Nurnberger, 4. Mike Marquis-Gilbert Broadhead. Ladies Main: 1. Kathy Laver-Cindy Slaughterbeck, 2. Linda Wallingford-Shirley McCullough 3. Cheryl Putham-Margaret Hartzler, 4. Adriana Cramton-Arlene McCague. Consolation: 1. Donna Schultz-Lois Wegner, 2. Dian Darrah-Pat Tomko, 3, Janice O�Sullivan-Siggy Gudzus, 4. Jane Schram-Evelyn White. Friday, Nov. 16 SWCD A-4 at Trailer Estates, Single/Mingles. Main: 1. Tony Souza, 2. Kathy Kendall, 3. Ursala Joyal 4. Jim Lessard. Consolation: 1. Ken Handrich, 2. Moe Joyal, 3. Martha Kaufman. (7 players-no 4th place). Next Monday, Nov. 26 FL P-9A at Hawthorne, M/L Doubles, 75 points. P-9B at Briny Breezes, Singles, M/L. Non-walking. Also Monday, Nov. 26, FL A-6A at Clearwater, Any Ams/Any Doubles, 75 points. Also Nov. 26 FL A-6B at Spanish Lakes in Central East Coast District, 75 points. No District Tournament this week � Thanksgiving.
. Remember Black Friday, November 23, Palmetto Shuffle Club, $10 includes lunch, Pro and Amateur Divisions. Non-sanctioned, no points, just fun and avoid shopping crowds. Register by 8:45 a.m., play begins at 9:00. Single/Mingles, expect nice prize money. Additional info � Call Bob Comford. Happy Shuffling � Happy Thanksgiving. SWCD D-6 at Bradenton Tropical Palms, Nov. 8-9, M/L Draw Doubles, Restricted to State Ams and Pros, 16 frames/75 pts. Ladies Main: 1. Adriana Cramton-Evelyn White, 2, Cheryl Putnam-Nancy Sclafani, 3. Cindy Slaughterbeck-Arlene McCague, 4. Jill DeBruyne-Lois Wegner. Consolation: 1. Margaret Hartzler-Pam Nurnberger, 2. Terri Smith-Donna Schultz, 3. Letha DeVries-Janice O�Sullivan, 4. Brad Thomas-Pat Tomko. Men Main: 1. Larry Taylor-John Mickle, 2. Ed Leonard-Dave Welsh, 3. Larry Mardis-Ralph Lozano, 4. Arnie Congdon-J.R. Rathburn. Consolation: 1. Tom Putnam-Bob Kendall, 2. Richard McCowan-David Evenson, 3. Ira Snook-Gilbert Broadhead, 4. Murray Potter-Joe Kent. It is reportedly an active scene and growing. Note that this likely the most open shuffleboard venue in Illinois. Be prepared for new language at Royal Palms. Forget cues pushing discs; they push �biscuits� with �tangs�. Eating and drinking trumps convention? At the Fall Southwest Coast District Open Board meeting November 3, a few adjustments were passed to change some rules.
. The bunching of �byes� was supported unanimously. Instead of byes, scattered on the chart, they will be put together. The effect will eliminate some waiting around for a court assignment on the first day. This should help those who avoid tournament play because of so much waiting. Both players and tournament directors agree this will help.
. It was confirmed that State Amateurs playing in the Friday Amateur Division Tournaments will continue to earn Master Points, but not Move-up Points, and that each State Amateur must be matched with a District Am partner. That is, no 2 State Ams may partner on Friday in the Amateur Division.
. Golf Lakes will likely offer a Singles Tournament again in 2019-2020 (next season). This will assure that any player heading for the Masters will have at least one District opportunity to play in a Singles Tournament.
. Because of a caution to not move players up before gaining valid experience, in small tournaments (less than 12 teams) points will be cut in half, beginning next season (2019-2020). In other words, Main � point; 1,2,3 in Consolation � point. Presumably in singles, the same for tournaments with less than 8 players. This last change will not be in effect this 2018-2019 Season. October 29-31, FL P-5 at Bradenton, National Singles, M/L Walking-75 points, Non-walking-16 frames or 75 points. Men Walking Main: 1. Dwayne Cross, 2. Tom Putnam. Consolation: 4. John L. Brown. Men Non-Walking Main: 2. Ed Leonard, 3. Ralph Lozano, 4. Steve Slaughterbeck. Consolation: 1. Arnie Congdon, 3. David Welsh. Ladies Non-Walking Main: 2. Marlene Coburn, 3. Terri Smith. Consolation : 1. Flo Kowalewski. November 1-2 SWCD D-5 at Palmetto, M/L Draw Doubles , Restricted to State Ams and Pros, 16/75 pts. Ladies Main: 1. Cheryl Putnam-Margaret Hartzler, 2. Shirley McCullough-Jill DeBruyne, 3. Dianne Leonard-Lois Wegner, 4. Marcia Brazier-Kathy Laver. Consolation; 1. Pam Nurnberger-Evelyn White, 2. Pat Tomko-Adriana Cramton, 3. Linda Wallingford-Donna Schultz, 4. Joan Curwin-Bonnie Walker. Men Main: 1. Richard McCowan-Ron Nurnberger, 2. Murray Potter-John Roberson, 3. Dave Minnich-Dwayne Cross, 4. Brad Thomas-Larry Mardis. Consolation: 1. John Mickle-Ira Snook, 2. Larry Taylor-Arnie Congdon, 3. Ralph Lozano-John Hechinger, 4. Bill Batdorff-Bob Comford. November 2. at Palmetto, SWCD A-2, Any Amateurs, Mingle/Mingle. Main: 1. Ursala Joyal-Larry Fowler, 2. Jim Lessard-Larry Russell, 3. Sandra Kolasinski-Moe Joyal, 4. Rita Marderosian-Marlene Simpson. Consolation: 1. Frank Marderosian-Frank Robinson, 2. Mary Fowler-Walter Yoeckel, 3. Bill Bierema-Carl Kohorst, 4. Tony Souza-Martha Kaufman. Thursday, Nov. 8 SWCD D-6 at Bradenton Tropical Palms, M/L, 16 frames/75 points. Friday, Nov. 9 SWCD A-3 at Bradenton Tropical Palms, Mingle/Mingle, 16 frames/75 points. Monday, Nov. 12, FL P-7A at Bradenton, M/L Doubles, 75 points. FL P-7B at Melbourne Tropical Haven, Mixed Doubles, 75 points. Monday, Nov. 12, FL A-4A at Lee County, Any Ams/Any Doubles, 75 points. FL A-4B at Betmar, Any Ams/Any Doubles, 75 points.
. Dwayne Cross does it again, 1st Main, National Singles!
. Southwest Coast District has no Alternate State Delegate. Alternate Delagates are expected to attend FL State Board Meetings, 3 per Season normally, so as to be prepared if State Delegate unable to go to some meeting. On last Thursday, October 25, Bill Bierema of Golf Lakes was presented with his Certificate as a new Pro, effective October, 2019. Southwest Coast District President Jerry Stannard, also of Golf Lakes, made the presentation at SWCD D-4 at Golf Lakes. Bill Bierema, age 90, received a rousing ovation from brothers and sisters of the Southwest Coast District Shuffleboard fraternity. By our collective memory, it has been several years since a nonagenarian has moved up to this level for the first time, and in fact Bill will be 91 next October when he first plays as a new Pro. Born in Grand Rapids, MI in 1928, Bill was a Maintenance Man at a Furniture establishment in Zeeland, MI, retiring at age 64. The Bieremas now have a retirement home at Upper Silver Lake, near Ludington. After retiring, the Bieremas wintered in Englewood , Florida for 25 years, with no shuffling. Now get this � upon arrival in Golf Lakes, Gib Stannard taught Bill Bierema to shuffle. (Gib will turn 104 in December). Bill is also very thankful that Dwayne Cross introduced him to Bayshore Nazarene Church. He also thanks the grace of God to enjoy his present life of retirement. P.S. Note that Bill placed 3rd in Main in SWCD-A1 one day after defeat in SWCD D-4. FL P-4A at Lee County, Monday, Oct. 22, M/L Doubles, 75 points. Ladies Main: 2. Terri Smith and Partner, 3. Pam Nurnberger and partner. Ladies Consolation: 2. Cindy Slaughterbeck-Joyce Marquis, 4. Shirley McCullough-Flo Kowalewski. Men Main: 1. Larry Mardis-Tom Putnam. Consolation: 3. Ralph Lozano-Mike Marquis. FL P-4B at Betmar in Zephyrhills, Oct. 22, M/L Doubles, 75 points. Men Consolation: 1. Dave Kudro and partner, 4. Gerry Curwin-John L. Brown. SWCD D-4, Oct. 25-26 at Golf Lakes, M/L Draw Doubles, restricted to State Ams and Pros, 16 frames/75 points. Ladies Main (9 teams): 1. Pat Tomko-Letha DeVries, 2. Donna Schultz-Nancy Sclafani, 3. Cheryl Putnam-Lois Wegner, 4. Linda Wallingford-Jane Schram. Consolation: 1. Evelyn White-Marlene Coburn, 2. Marcia Brazier-Margaret Hartzler, 3. Adriana Cramton-Joan Curwin, 4. Cindy Slaughterbeck-Terri Smith. Men Main (18 teams): 1. John L. Brown-Larry Mardis, 2. Gerry Johnson-Paul Knepper, 3. Larry Taylor-Grant Childerhose, 4. Bob Comford-Faren VanDeGrift. Consolation: 1. Mike Marquis-Ralph Lozano, 2. Steve Slaughterbeck-Vern Wallingford, 3. Ed Leonard-Nelson Kellogg, 4. Arnie Congdon-Jean Wilson, Jr.
SWCD A-1, Oct. 26 at Golf Lakes (9 players). Main: 1. Mary Fowler, 2. Larry Fowler, 3. Bill Bierema, 4. Frank Marderosian. Consolation: 1. Richard McCowan, 2. Martha Kaufman, 3. Larry Russell, 4. Rita Marderosian. Thursday, Nov. 1 at Palmetto, SWCD D-5, M/L Doubles, Restricted to St. Ams and Pros, 16 frames/75 pts. Lunch available. Friday, Nov. 2 at Palmetto, SWCD A-2, Mingle/Mingle, 16 frames/75 pts. No partner needed. Saturday, Nov. 3, SWCD Fall Open Board Meeting at Bradenton Shuffle Club, 1:00 p.m.
Monday, Nov. 5, FL P-6A at Tavares, P-6B at Port Charlotte, M/L Doubles, 75 points. Also Monday, Nov. 5, FL A-3 at Lakeland, Any Ams/Any Doubles, 75 points.
. Letha DeVries recently returned to competition, placed 1st in Ladies Main at Golf Lakes after long absence as a nurse during Charlie�s long steady recovery. We salute her success in both efforts.
. Word is received of the death of Marlene Slosser after long illness. Marlene lived at Tri-Par for several years and competed vigorously and joyfully.
. Black Friday, November 23 at Palmetto Shuffle Club, Singles/ Mingle, Non-Sanctioned Tournament. $10 includes lunch. Prize money in both Am and Pro Divisions. Registration: 8:00-8:45; Start 9:00. No points, but fun, fellowship. Their name is Cross, but their personalities are pleasant. 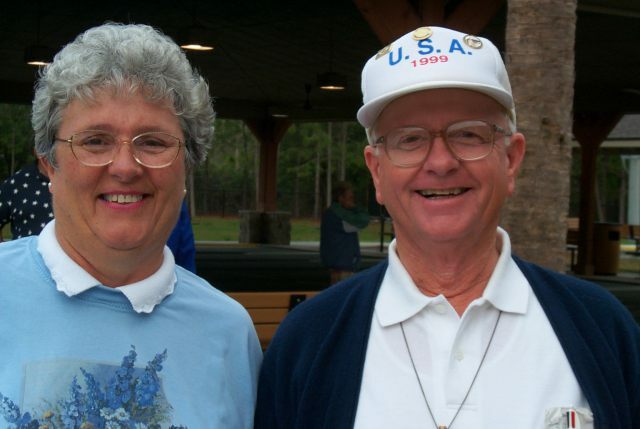 Dwayne and Judy Cross are a devoted couple whose contributions to our shuffleboard fraternity are exemplary. Dwayne has competed in Florida for only 15 years and last week earned his 200th District point making him eligible for induction into the Southwest Coast District Hall of Fame. Dwayne has been on Team U.S.A. in Australia, Germany, and twice in Canada. He is also a new member of the Michigan Shuffleboard Hall of Fame. The Crosses summer at Grand Blanc, MI where Dwayne teaches others to play and enjoy this sport. He also teaches at his Condo association, and has helped with several District Schools in past seasons. Also, the Crosses long sponsored tournaments in the SWCD in memory of their late son, a capable veterinarian. Dwayne retired from General Motors after 37 years. This column salutes Dwayne and Judy Cross for their devotion and good example. FL P-3A at St. Petersburg, Oct. 15-16, Mixed Doubles, 75 points. Main: 3. Nancy Sclafani and partner, 4. Judy and Dwayne Cross. Consolation: 1. Joan and Jerry Curwin. FL P-3B at Lee County, Oct. 15-16, Mixed Doubles, 75 points. Consolation: 3. Pam and Ron Nurnberger. FL A-1 at St. Petersburg, Oct. 15-16, Any Amateurs/Any Doubles, 75 points. Main: 4. Martha Kaufman-Bill Bierema. SWCD D-3 at Bradenton, Oct. 18-19, M/L Doubles, 75 points. Ladies Main: 1. Nancy Sclafani-Terri Smith, 2. Pat Tomko-Lois Wegner, 3. Shirley McCullough-Flo Kowalewski, 4. Cindy Slaughterbeck-Adriana Cramton. Consolation: 1. Marlene Coburn-Pam Nurnberger, 2. Arlene McCague-Cheryl Putnam, 3. Donna Schultz-Joan Curwin, 4. Linda Wallingford-Letha DeVries. Men Main: 1. Faren VanDeGrift-Ben Coy, 2. John Roberson-Nelson Kellogg, 3. Don Brun-Arnie Congdon, 4. Vern Wallingford-Jean Wilson, Jr. Consolation: 1. Grant Childerhose-Tom Putnam,, 2. Dwayne Cross-Dave Minnich, 3. Ron Nurnberger-Larry Taylor, 4. Ed Leonard-David Welsh. Thursday, Oct. 25, SWCD D-4 at Golf Lakes, M/L Draw Doubles, Restricted to Pros and State Ams. Friday, Oct 26 SWCD A-1 at Golf Lakes, Mingles/Mingles Draw, 16/75 pts. No partner needed. Bring your lunch. Monday, Oct. 29, FL P-5 at Bradenton, National Singles, M/L, walking 75 points, non-walking 16 frames. Monday Oct 29, FL �A-2 at Sebring, Any Amateurs/Any Doubles, 75 points.
. Thank you to all readers for accepting our move to Wednesday publication.
. Correction: Last week�s article mistakenly named Steve Slaughterbeck as my partner, 1st Consolation at FL P-2A at Avon Park. Apology to Stan Kowalewski, my actual partner there.
. 2018-2019 FL Previews now available from your Shuffle Club or at any tournament while supplies lst. 150 pages of everything happening this season, rules, news, pictures, records, schedules. At $1.00 this is the best bargain in sports literature. The Fall meeting of the Florida Shuffleboard Association Saturday October 13 produced a few new rules and notices.
. Clubs hosting State Tournaments must obtain sponsors. Failure to obtain a sponsor will be reason for a club to lose permission to host that tournament again. (Southwest Coast District always obtains sponsors for State Tournaments).
. The 87th Annual State-Sponsored Singles, M/L, W/NW, will be at Clearwater January 14th. Tickets will be available later this month at $35 each. The plans sound very nice and several will be eligible for induction into the coveted FL Shuffleboard Hall of Fame, to be followed by the Winter meeting of the Florida Shuffle Board Association.
. The famous St. Petersburg Shuffleboard Club at Mirror Lake, a National Historic Site, host of FL P-3A earlier this week, has asked to host the FL Masters in 2020. No State Tournaments have been held there since 2004 which was regarded as the former �mecca� for 80 years. Club membership has grown from 60 to 1200 in the past decade. Most of those new players are Millenials who show up on Friday evenings at Mirror Lake Park.
. FSA voted permission beginning next season for Districts to choose other than 75 point games, such as frame games, or limited frame games for State Tournaments for Amateurs. Districts have a year to decide if participation might grow under such a test. FL P-2A at Avon Park, Oct. 8-9, M/L Doubles, 75 points. Men Consolation: 1. John L. Brown-Steve Slaughterbeck. Lades Main: 4. Pam Nurnberger-Nancy Sclafani. FL P-2B at Zephyrhills Shuffle Club, Oct. 8-9, M/L Doubles, 75 points. Ladies Consolation: 3. Terri Smith-Marlene Coburn. SWCD D-2 at Bradenton, Oct. 11-12, M/L Doubles, 75 points. Ladies Main: 1. Flo Kowalewski-Nancy Sclafani, 2. Del Schram-Jane Schram, 3. Lois Wegner-Marlene Coburn, 4. Pam Nurnberger-Linda Wallingford. Consolation: 1. Arlene McCague-Evelyn White, 2. Cheryl Putnam-Shirley McCullough, 3. Adriana Cramton-Helen Lunsford, 4. Donna Schultz-Cindy Slaughterbeck. Mens Main: 1.Ron Nurnberger-Larry Mardis, 2. Nelson Kellogg-Paul Knepper, 3. Bill Batdorff-Dave Minnich, 4. Mike Marquis-Gerry Curwin. Consolation: 1. Tom Putnam-Grant Childerhose, 2. Dave Welsh-Bob Comford, 3. John L. Brown-Dave Evenson, 4. Gerry Johnson-Bill Bierema. SWCD D-3 at Bradenton, Oct. 18-19, M/L Doubles, 75 points. FL P-4A at Lee County, Oct. 22-24, M/L Doubles, 75 points. FL P-4B at Betmar, Oct.22-24, M/L Doubles, 75 points.
. This column will be on Wednesdays for the indefinite future.
. A brand new tournament FL A-23, March 25, 2019 at Sebring is the Tournament of Champions for Amateurs. Any Ams , Singles Eligibility for this new tournament will be as follows. Placing in any FL-A tournament this season lets you play this year. Any place, 1-4, Main or Consolation. Placing twice gives you 2 years eligibility, Placing three times gives you 3 years eligibility. We may search back one year on this first year. This FL P-A23 will be at the same time and place as the FL P-26 Tournament of Champions, open only to Pros. Here is opportunity for post season play, even for District or State Amateurs. An Eligibility list will be prepared. If you have questions, see Jerry Stannard, District President or John L. Brown, State Delegate.
. An oversight last week: I failed to mention the death of Art Vogel of Betmar, who competed faithfully for a couple of decades of state Tournaments including in our District. Art played for years with Don Darwin and later with George Darwin. Art was a faithful friend and good example in every way.
. This just in at deadline � Mrs. Vivian Ball, wife of the irrepressible Earl Ball passed away in her sleep from a sudden heart attack Saturday night. October 13. We send our sympathy to Earl, their family, and friends in Zephyrhills and elsewhere. Vivian traveled with us to several nations for shuffleboard events. This column resumes today after one week of Fall tournaments. We were happy to see the pleasant return of Larry Mardis of Ohio after a couple of season�s absence. Larry was caregiver to his mother who was in declining health for many months prior to her passing last season. Our District lost a true champion shuffler in the passing of Jim Miller last May. Jim and Jo have done so much over the years to help upgrade the Bradenton host site. Jim traveled statewide and remained humble despite the fact that he already had enough Florida points to be in the Hall of Fame 3 times. He also helped recondition many shuffle courts in this area and in Indiana. We offer our sympathy to Jo and her family. Our sympathy also to Ann Wedel and her family as Walt Wedel also passed on in June after long illness. Walt and Ann lived in Michigan and wintered at Golf Lakes for more than 20 years. Walt and Earl Dunn were a strong team when I began to play here. Long time State players may remember Lois McCormack who also played well, including representing Canada in International play for years. Stan The Man of the Shuffler website has done much for publicity in our sport. It is proverbial that a great lady is often the back up of a great man. Thelma Springer of Zephyrhills also has completed her life. This columnist first met Thelma at Lakeside, OH where she had a good record. She also used to stay a few days annually with Jane O here in Trailer Estates. A-16 at Trailer Estates is March 8-9 at TE, Any Doubles, 75 points. SWCD C-1 at Bradenton, Oct 4-5, Open Any Doubles. Main: 1. Bill Hollabaugh-Arne Congdon, 2. Pam Nurnberger-Nancy Sclafani, 3. Ron Nurnberger-Larry Taylor, 4. Ben Coy-Faren VanDeGrift. Consolation: 1. John L. Brown-Steve Slaughter beck, 2. Donna Shultz-Larry Mardis, 3. Lois Wegner-Marlene Coburn, 4. Grant Childerhose-Joe Kent. Today is the second day of FL P-2A at Avon Park and P-2B at Zephyrhills, M/L Doubles. Thursday, Oct 11 SWCD D-2 at Bradenton, M/L Open Doubles, 75 points. Next Monday, Oct 15 FL P-3 at St. Peterburg, P-3A,P-3B at Lee County, Mixed Doubles. Also Monday Oct. 15, FL A1 at St. Petersburg, Any Ams/Any Doubles.
. 10 of 16 winners at Port Charlotte from South West Coast District! Happy Shuffling.